This book is part of the popular ‘Your Towns and Cities in the Great War’ series, building up a collection that covers how the First World War impacted communities up and down the country. Whilst the books are naturally of interest to those who are from or live in the areas in question, they also help provide a broader understanding of the social and economic impact of the war. The book covers what you would expect to find, with a variety of local stories drawn from sources such as the local newspaper used to highlight particular areas. The impact of the war on the area is carefully considered. Many trees were cut down for the war effort, and there was a reduction in bus services as petrol was diverted. The lack of manpower impacted on local services, particularly those staffed voluntarily such as the fire brigade, and ultimately many women took over these roles. Belgian refugees were housed in the area and fundraising campaigns were run to help them provide them with supplies. When rationing was brought in the town witnessed an increase in illness. On the military side like much of the rest of the country men flocked to enlist at the outbreak of war; interestingly one local landowner encouraged his workers to enlist, and when advertising for replacements stated that men of military age need not apply. Many local men served in India with the ‘Dorking Company’ of the Queen’s Regiment. Wounded soldiers arrived at many of the large family homes in the area, turned over for use as hospitals. Many of these grand houses slipped into decline during and after the war, never to recover. Many troops (particularly Yeomanry) were based in the town and proved popular, especially with the local businesses. The town also witnessed an influx of people from London scared of the ‘Zeppelin threat’, which put further pressure on the town’s resources. Conscription is also touched on, with details of some of the local cases for exemption, including conscientious objectors. Other evidence of the war could be seen in the local area, with a Prisoner of War camp for captured Germans established in the nearby village of Holmbury St. Mary. The book is scattered with vignettes about local personalities and soldiers. These include the American millionaire Alfred Vanderbilt, who lived in the area and died when the Lusitania was torpedoed in 1915; composer Ralph Vaughan Williams; boy soldier Valentine ‘Joe’ Strudwick, whose grave is now one of the most visited in the Ypres salient; and Charles Robertson who was awarded the Victoria Cross in 1918. The book naturally concludes with the how news of the armistice was received, with a final chapter on war memorials and remembrance and how the 269 names on the town’s war memorial are commemorated. Books such as this benefit from the prodigious use of pictures to illustrate the text, and thankfully pictures are in abundance. 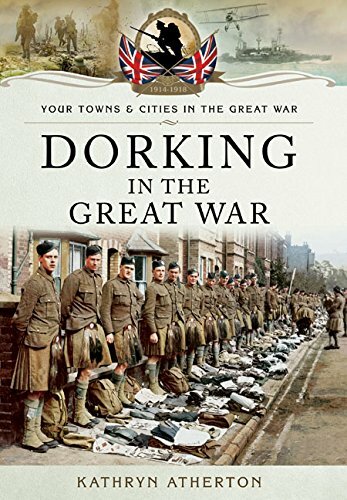 There are a couple of basic errors on the military side – for example stating that Arras, Cambrai, and Third Ypres took place in 1915 – but these do not detract from what is a fascinating insight into Dorking during the war.